What is your purpose in parenting? I know few parents who haven't thought about their purpose in parenting by answering some of these important questions: What do I want most for my children? What kind of character traits do I want them to have? How do I want our family to be known? What do I want our children to value? Yes, you know these questions well. Because we all have big hopes and dreams for our kids. Love inspires big hopes and dreams. There is so. very. much. we want for them. Even if you didn't sit down with pen and paper and write it all out, (or for the more OCD parents, put it into quantifiable outcomes in an excel spreadsheet) you have probably given your purpose as a parent some thought. Can I tell you what my purpose was in my earliest years of parenting? It was to raise perfect little Christlike boys. (Oh I shudder to even write that.) And if you're a Christian mom and wondering, "What's so wrong with that?" please stay with me here! I will make lists and rules and charts that will help the kids obey Mike and me perfectly and will help us all obey God perfectly. And we will try really hard to make very few mistakes and have very little regret. And I will feel really good about myself because I'm obeying God so well and doing exactly what His word requires of me. I will find my identity in being a Godly and good mom. I could go on and on but I think you've had enough. I have to tell you, all this nonsense was born in a heart that truly loved Jesus. Like, a lot. The problem was, that same heart was struggling to believe Jesus really loved her as the royal mess that she was. I’d made some horribly stupid choices a few years earlier (that’s a blog for another day) and now I was going to make God proud of me again. I was caught up the in the world’s web of perfection, and performance, and pretending. Grace was lost on me. What nobody had told me is that becoming a parent to little people was going to reveal all, and I mean all, of my weaknesses. No, this was not the time to try and make God proud! So sadly, I spent the first couple years as a mom parenting with a sole focus on loving God perfectly and being a perfect mom and raising perfect kids. All so God would love, and approve of, and accept us in return. Yes, grace was lost on me. Until one painfully revealing day when God said, “enough!” It was the day my eldest son, Cal, brought home a handmade card from pre-school that described the desperate state of our family. His words hit me like an arrow to the heart. I remember holding that card and sobbing, “How could that be my child’s story when I’ve been trying so hard to get it right?” Though I was devastated to see myself and our family through Cal’s eyes, that was the day God’s grace broke in and freedom began to take it’s rightful place in our home. It was the day my purpose in parenting began to radically change. 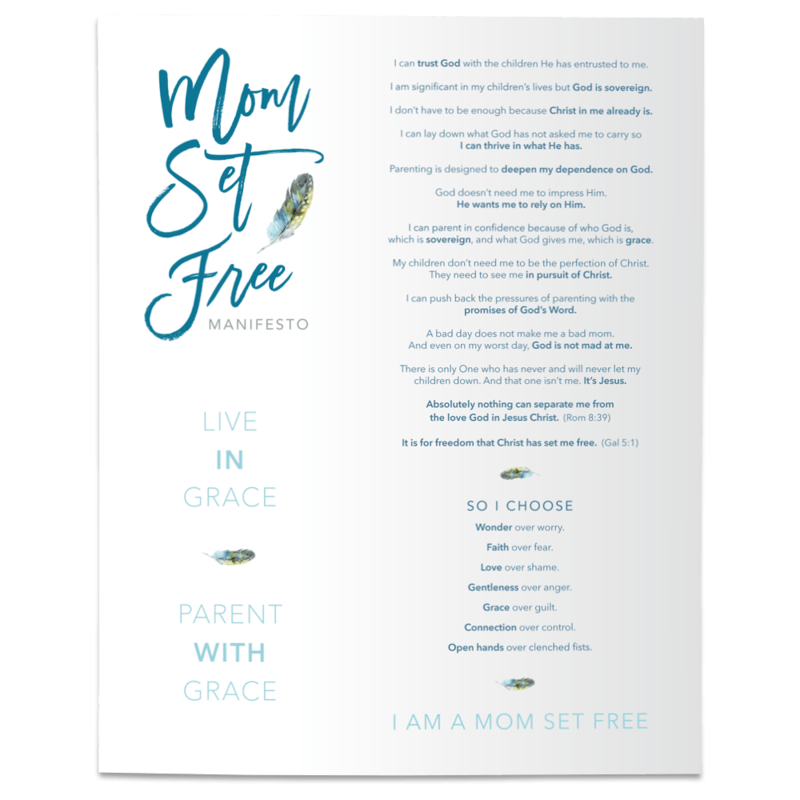 It was the day my eyes opened to how I’d failed to make the unconditional love of God in Christ the starting place for our family, and how I was crushing us with lists and charts for perfection. It was the beginning of understanding how my boys heard less about God’s unwavering, never-ending, wholehearted love for them, and more about the perfect love I expected them to have for God and one another. In other words, I was growing boys who were only focused on what they had to do for Jesus rather than finding freedom, and purpose, and joy in what Jesus has already done for them. I had it all backwards. I’d re-written the verse to read "God loves us because we first love Him." So backwards. 1 John 4:19 says, “We love because he first loved us.” He first loved us. His love inspires our love. His obedience inspires our obedience. His sacrifice on the cross inspires our sacrificial sevice to one another. His grace must be our starting place. Oh, now I get it. Infusing the knowledge and experience of His love into the hearts of my children must be our primary purpose if my desire is to see my kids love God and one another. As I slowly but surely began to truly accept the radical and "doesn't make a bit of sense" nature of God’s grace for rebellious hearts like mine, I became a vessel of that love and grace to my children. And we’ve never been the same. My new purpose was to see them grow more and more aware of their great need for Jesus, and more and more aware of Jesus' great love for them. Because that is where their love for God and one another will flourish. Everything they say and do, experience and give, desire and love, hope for and dream about will be influenced by and impacted by this one thing - Do they know the wholehearted and unconditional love of God, in Jesus Christ? The love that inspires us to trust and obedience. The love that frees us to confess our sin and need for Jesus to not only save us but also mold us into His image by the power of His Holy Spirit. The love that (alone!) produces the fruit we so long to see in our kids lives. Our family verse is still Matthew 22:37-39 because it is good and wonderful and the greatest commandment. And love, after all, is the source from which all the other good stuff flows. But Matthew isn't our starting place. This is my new purpose. Ensuring my kid’s identity is anchored firmly and immovably in the identity Christ has bestowed upon them: radically, wholeheartedly, unconditionally loved children of God. In our failure, in our weakness, in our imperfection, in all of our getting it wrong. His love goes beyond anything we can understand. And this new purpose- it's changed everything.